When shopping for new flooring, many homeowners assume they will hire professionals to do the installation. However, many flooring materials make it easy for DIYers to tackle the job themselves, even with little or no prior experience. 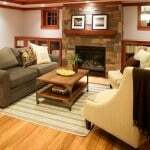 Installing floors yourself can save you a lot of money and can even be a fun weekend project with friends or family. Having said that, in order for your installation to be as painless and trouble-free as possible, you will need to make sure you have all of the right tools for the job. 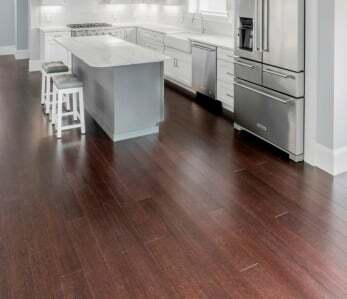 Below, we take a look at some of the most common flooring options and provide a checklist of necessary tools as well as some installation tips. 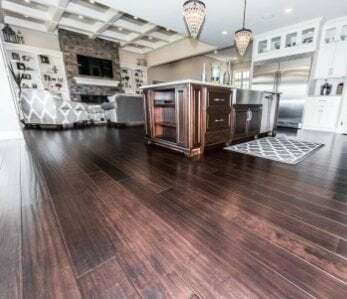 Ask any homeowner why they love hardwood floors and they’ll most likely tell you it’s because of the natural warmth and beauty they bring to any room. Hardwood floors come in a wide variety of species from exotics to traditional, so you’re sure to find something that will compliment your particular design style and color palette. 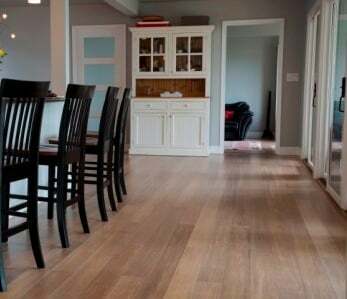 The type of sub-floor you have may determine the installation tools you require for your wood floor installation, as can whether you’ve decided to glue or nail down your floor, but you can use the list below is a general guide. If you’re nailing the floor down you will most likely rent a flooring nailer and you may get home and find it doesn’t have a protective plastic boot that is intended to keep it from scratching the floor. A simple but effective fix is to cover the metal base with masking tape. Make absolutely sure the nails are set properly, and that you’re using an approved nail size, or you’ll end up with goosebumps at the seams. Also, when the installation is complete, be sure to thoroughly inspect your new floors for any nicks or minor gaps and fill these with wood putty that is the appropriate color. Homeowners who choose ceramic floor tiles do so most likely because tiles put the tile in versatile. Tiles can be used in numerous ways throughout the home and in many different rooms without the worry about water, staining or design. 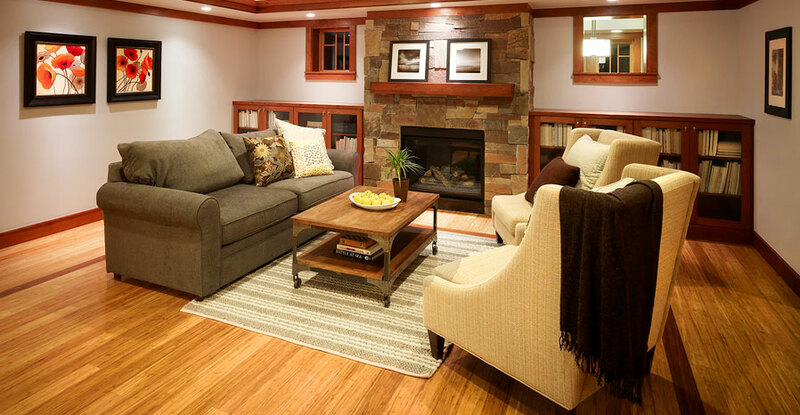 Many homeowners don’t take into account, however, that the surface is very hard and not as friendly as hardwood to feet and legs – keep this in mind. Keep in mind the larger the tiles, the easier the installation will go. Larger tiles are commonly used for bathroom walls but can also be used on floors and in kitchens and other rooms as well. Cutting corners – literally – on ceramic tiles is tricky and you should use a wet saw. Renting one is fine and will save you time and frustration. Cutting tiles perfectly the first time will have big payoffs when it comes time for arranging and installation. Wet saws are relatively inexpensive to rent and can be found at most home improvement stores. Vinyl is an affordable option for those who want a long-lasting and durable floor, making it a great choice for high-traffic areas. 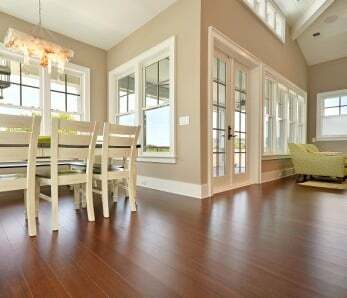 When installed correctly over proper subflooring, vinyl is incredibly resistant to dents, scratches, and stains. It is also easy to install yourself and simple to clean and maintain. Any time corners are cut on the vinyl sheeting, you should reinforce the material with two pieces of masking tape. This will help protect the corner from tearing as the vinyl flooring is moved into position. As more and more homeowners are turning away from traditional wood flooring, the popularity of bamboo floors continues to increase. One of the greatest benefits of bamboo is that it is plentiful across multiple regions of the world and it is easily replenished. Because of this it is a logical choice for those individuals who want the look and feel of traditional hardwood but don’t want to contribute to the destruction of the world’s forests. To ensure bamboo planks show off their natural beauty, most bamboo floors are laid parallel to the longest wall or outside wall. The direction of the planks should be based on the layout of the room and locations of entrances and windows. Installing floors yourself can be a fun weekend project that, in the long run, saves you a lot of money. Just be sure to have the right equipment for the job. Oh, and don’t skimp on the pizza and beers, especially if you’ve recruited some friends and family to help you. 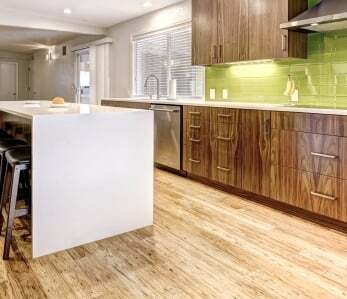 ‹ Can Bamboo Flooring be Used in Laundry Rooms?